I’m writing this from Medford, OR, where we traveled to spend the beginning of the new year with Sara’s parents. It has been a very relaxing trip. We were planning to head home today, right about now, but the weather is not cooperating with us. There are severe weather warnings in the mountains I-5 passes through to get back to California. So we’re watching the weather and a website that shows travel conditions. 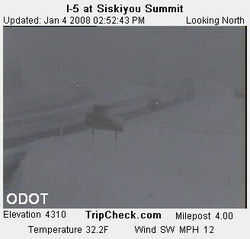 This picture is from a road camera showing current conditions. I think we’ll be staying here for a little bit.